At 12pm on 10th April 2018, Ford unveiled the all-new Ford Focus to the world and press in London. Giving everyone a glimpse on the cars they have been spending so much time working on and it was definitely worth the wait as Ford are calling the all-new Ford Focus their "best car yet". The stunning all-new Ford Focus has now been unveiled for everyone to see. With a totally new design the all-new Ford Focus oozes comfort and space with a new and exciting driving experience that is complimented by top of the range technology. 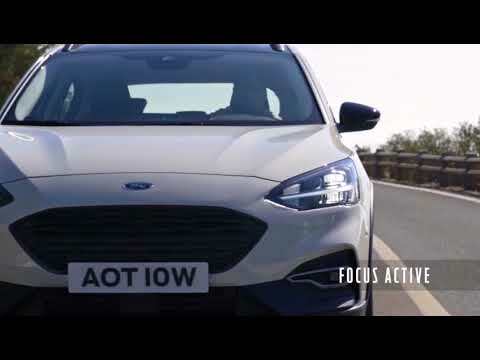 Ford have created multiple derivatives of the New Focus ranging from the Focus Titanium, Focus ST Line, Focus Vignale and the first Focus Active Crossover. All of which will make a huge impact on the mid-sized car category. Why not see try them for yourself and book a test drive today! The all-new Ford Focus has more advanced and a wider range of features than any other Ford vehicle. With the new sophisticated Ford Co-Pilot360 enhance the technologies of driving, parking and protection, it is also designed to make the driving experience less demanding and more comfortable and safer. The ACC (Adaptive Cruise Control) with Stop & Go, Lane-Centring and Speed Sign Recognition helps the Focus to easily maintain a safe driving distance from surrounding vehicles, this in turn helps to reduce the stress of driving on long journeys by helping to keep the vehicle centred in its lane. The technology goes a step further by adjusting the vehicles speed to within legal limits by monitoring the overhead gantries and roadside for speed signs as-well as using information from the on-board navigation system. The benefits of active park assist has been made even easier to park, delivering fully-automated parallel and perpendicular manoeuvre at just the push of the button. The smart system will identify a suitable parking space and all that needs doing is selecting neutral and holding down a single centre console-mounted button. The vehicle will then fully control the forward and reverse gear selection, throttle and braking as well as steering. The Ford Focus is capable of maneuvering into spaces just 110cm longer than the car itself. All-new Ford Focus customers will have the choice of a wide range of Ford EcoBoost petrol and Ford EcoBlue diesel engines all of which deliver refinement and optimised power, the engines also all meet the latest stringent Euro 6 emissions standards. The fuel efficiency and CO2 emissions from both the EcoBoost engines are enhanced using Ford-s industry-first cylinder deactivation system for a three-cylinder engine, which is able to automatically stop one of the engines cylinders when full capacity is not required, for example when coasting or cruising with light demand on the engine. The engine is capable of disengaging or re-engaging one cylinder in 14 milliseconds - this is 20 times faster than the blink of an eye! If you would like to book a test drive on the all-new Ford Focus then click the button below.